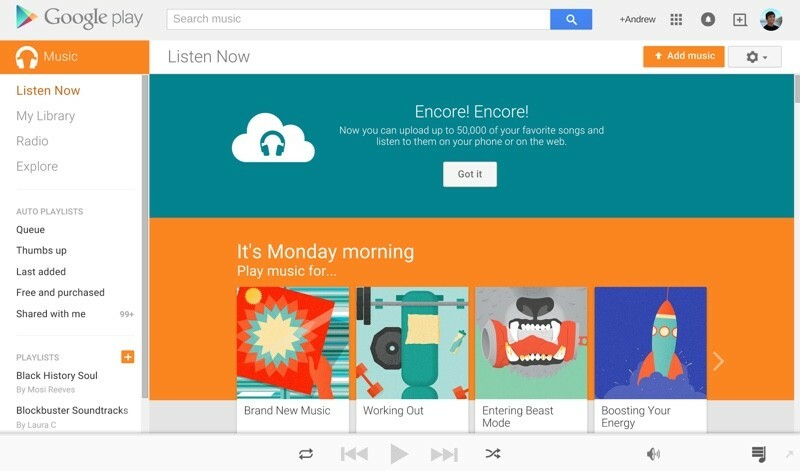 Google today announced an update to its Google Play Music service, expanding the amount of available storage. Users can now store 50,000 songs in the cloud at no cost, up from 20,000. Content stored within Google Play Music can be played on computers via Google's Music Manager app, on iPhones and iPads via the recently redesigned Google Play Music app, through a Chrome extension, through Chromecast, and on Android devices. Google's Google Play Music storage does not require a subscription to Google Play Music to use it, making it free for all users. Those interested in using Google's free music storage can access it by going to the Google Play Music website, skipping the subscription offer, and going straight to the music interface where there's an option to upload music. Content can be uploaded directly from an iTunes library or from any folder. Google, of course, hopes users will opt-in to its $9.99 per month subscription music service when signing up for free music storage, which offers on-demand access to millions of songs much like Spotify or Beats Music. With the boost in free storage space, Google Play Music gains a bit of a competitive advantage over Apple's iTunes Match service. iTunes Match costs $25 per year and allows users to store up to 25,000 songs in iCloud, but it gives users the benefit of accessing 256-Kbps AAC DRM-free quality music for any uploaded song that's also available in the iTunes Store. For those in the Apple ecosystem, it's arguably easier to access songs on any device through iCloud using iTunes Match, but Google Play Music is a viable alternative as the company now has apps for the Mac, iPhone, and iPad available. Despite early rumors of an iPhone 6 that didn't appear, followed Apple's continued procrastination and (at that time) refusal to build a phone with a modern sized display, I parked my iP5 switching to a Nexus 5. Immediately I registered for Google Play Music. Now one year later I've removed my iTunes music, put it all in Google with copies on my server, it's nice to be completely reliable and wireless. iTunes was good in its day, but that was years ago in Apple's wired USB cable period. Google Play destroys iTunes Music. You do realize that Google can offer it for "free" because they're mining your music preferences and monitizing that data by selling your profile to companies who want to manipulate your perception of their products so that you'll buy them more readily? Thanks, but no thanks. I'd rather part with $25 bucks. I've used both for a couple years (locked in Google All Access at $7.99) and Match, which is limited to iOS/Mac. About half my collection is with Google, and all in Match. I prefer Google's interface as Match can be annoying...less so than general iCloud services, but annoying nonetheless. In terms of the cloud, Google feels to me years beyond Apple. So disappointed there isn't a simple iCloud Storage app like Google's Drive, which has been amazing for the past two years. Meanwhile, tim cook still thinks it's a great "value" to charge $25 a year to access your music. Heck, even Amazon offers free music storage. Get with the time apple, and fire cook already! I was going to do it, but it requires a credit card for verification. Plus I have to deal with the apps. Eh, I don't feel like it. I have been a mostly-happy iTunes Match user since day one, despite bugs now and again creeping in, but the one thing I wish we would see is an increase in songs matched. I get the 25k is a lot, and way more than most people need, but for those that do have more music, it's a colossally annoying limitation. Hopefully this motivates Apple to make a change. You have a credit card - debit, vons card, cable (Comcast), phone service (Att Sprint Verizon)?...... Guess what? You just gave your data to those companies.... Where's your outrage for that? Why aren't you mad when you receive credit card offers or coupons in the mail? Why don't you feel violated when these things are delivered straight to your home? "But, oh no! Google knows that I listen to the Ricky Martin.. Now I'm going to receive a email (which I can delete in 2 seconds) about his other albums." You have been giving out your personal data since you've been a teen....Why cry now? Um, from what I'm seeing Google Play is $9.99 a month. The $9.99 lets you listen to anything Google has available in the Google Plays store similar to how subscribing to iTunes Match lets you play anything on iTunes Radio that iTunes sells in the iTunes Store. I don't own Bruce Springsteen's Born in the USA album so I don't have it in iTunes Match. On Google Play, I can search for the title song and play it instantly. On iTunes Match, I can search for that same song, select that song from the songs list in my search and yet, it still plays a random song from that album and creates a station for it.